Following the paw prints of their larger carnivore cousins, coyotes, fishers are now returning to New York City. A new photograph confirms that at least one animal has found its way to the Bronx, after a scattering of records across Westchester County in recent years. These oversized weasels (females are 4lbs, males weigh up to 13lbs) are adaptable predators recently found to climb trees to hunt the squirrels that typically overrun suburban areas. 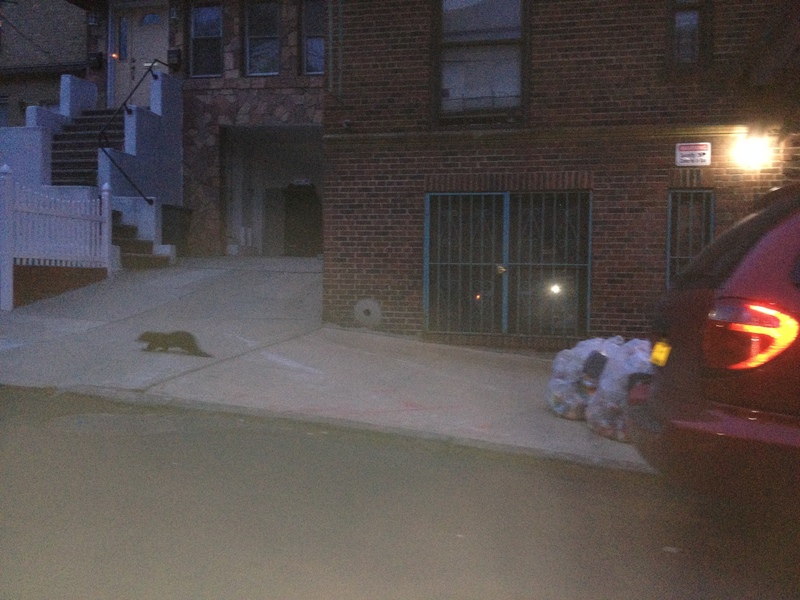 NYPD officer Derek Lenart captured this photograph of a fisher walking down a Bronx sidewalk at dawn on 15 April 2014, producing the first ever evidence of the species living in New York City. Their long skinny build also makes fishers keen tunnel users, which helps them crawl through drainage culverts to cross under roads and avoid becoming road-kill. Their love of tubes and rodents should also make them keen ratters, although no fisher has ever lived so close to so many rats as our recent Bronx visitor. Fishers lived in Manhattan when the island was first settled, but were one of the first to disappear due to the high prices fetched by their fur. Trapping pressure only increased over the centuries, leaving a handful of fishers surviving in the Adirondacks and other wilderness areas when trapping was banned in the 1930’s. Their population recovered, slowly at first, but is now booming across the Northeast, even with trapping seasons reinstated. After repopulating wild and rural forests, they began colonizing upstate suburban forests about a decade ago, and seem to be doing quite well there. Camera trap surveys suggest they may be more common suburban Albany than nearby wildlands, possibly because of the abundant squirrel populations. Our GPS tracking study showed how suburban animals use movement corridors to move between favorite hunting grounds, skirting around neighborhoods to find the next small patch of woods. The recent Bronx fisher was photographed at dawn by Derek Lenart, a NYC Police officer who works the night shift. He saw it cross the road in front of him and run underneath parked cars and along the sidewalk on Hennessey Place, just south of Bronx Community College, and three blocks east of the Harlem River. The fisher then turned up a driveway, ran into a back yard and out of sight. Although they can be active during the day in wild areas, fishers living near people are nocturnal. This fisher was probably looking for a place to hide for the day, either down a hole or up a big tree. Judging from the picture this a male fisher, likely a dispersing animal looking for a female and a new place to settle down. If he can find a place to sleep and something to eat he might stick around. Bronx squirrels would make good fisher prey, but things could get really interesting if fishers start hunting rats in New York. Officer Lenart says he sees rats everywhere on his nightly patrols, some places in huge numbers. The other animals he sees at night – raccoons, possums and skunks -are not rat predators. Coyotes can certainly dispatch a rat, but their large size makes it difficult for them to move around the metro area outside of parkland, and Officer Lenart has never seen one in his five years working the night shift in the Bronx. No predator keeps a lower profile than fishers; if they can use their tunnel-running to hunt rats, and tree-climbing to get squirrels, they could make a nice living in New York City. Fishers pose little threat to people. Although they are rumored to kill cats, there is little evidence to support this idea. But lets not get ahead of ourselves here – one brief glimpse of one male fisher in the Bronx does not mean the end of your local rat problem. It does, however, put an exclamation point on the recovery of fishers in the region, and highlights the adaptability of wildlife if given a chance. For more on this story check out the video below where I discuss the Bronx fisher with Brian Malow. Someone should start a re-integration program to move some of the fishers from upstate into the burroughs. If enough of a breeding population exists in an area, the population will increase. So do we need to be worrying about the pesticides found in the prey they’d be catching in the Bronx? Well, lets see here….I think we need to pass a bunch of new laws in NYC to protect this “newcomer”. No new buildings, construction,or any other economy-boosting activity that may impact the new Fisher population! Every time a specie turns up on the edge of its current or historic range, it seems that some off-the-wall animal protection group starts suing to have laws changed to protect the beasts, even when the overall population of the animal is doing fine elsewhere. Maybe we could at least get the state to do an exhaustive Environment Impact Statement to see if the Fisher is going to have a detrimental effect on the feral housecat herd in the Boroughs! On Saturday evening July 12, there was a long, thin weasel-like mammal swimming in the Harlem River just off the Columbia U. crew-team dock in Inwood (upper Manhattan). With its head just out of the water, it left a long V wake and dove under at one point for a few minutes before resurfacing. I assume it was the Fisher, but it also looked like a river otter. Interesting… Seals are back in the harbor – but they are usually only around in the winter… So you could be right. It’s also possible it was a beaver… There are at least 2 beavers confirmed to be living on the Bronx river – near the zoo and botanical gardens. While skunks – raccoons – possums might not prey on mature rats… Isn’t it true they eat the young if they find the nest..?? Also – I’m surprised that officer hasn’t seen a coyote yet in the Bronx… They certainly are around… But hey – he saw a fisher which few people see. There were others in the Bronx who got a picture during the day of presumably the same fisher. Hi, glad you like the blog. Reading other science blogs is probably the best place to start, looks like you already have a good start there. The next step is to start writing one – my advice here is to start small. Do something easy and short to get started, and don’t worry to much about it. The more practice you get the better you’ll be.